One day, the boys at JTs were sitting around the shop in the summer, looking at their 4 wheel ATVs when the idea came to them. Why shut down the fiberglass shop in the summer when there was all those ATVs hitting the trails with their rider's hands getting hit by the branches and everything else. 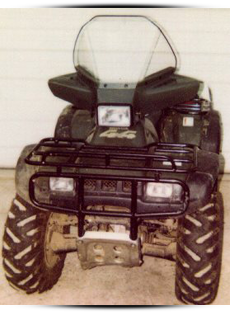 Thus was born "JTs Weatherguard ATV Fairings", using the same hand laid fiberglass process as in the snowmobile hoods. Give yourself that added comfort and don't get whacked by the trees, give us a call @ 1-800-465-5668, your hands will appreciate it.